Embryo Transfer - In the late seventies non surgical embryo transfer was developed where bloodless procedures were less evasive than surgical removal. It was also a time when federal taxes were an all time high and the veterinarian expense process was beautiful when packaged properly. At DCCI near Calhan, CO a serious embryo transfer facility was developed. It was obvious that the TL industry was ready to explode with the highest quality genetics. 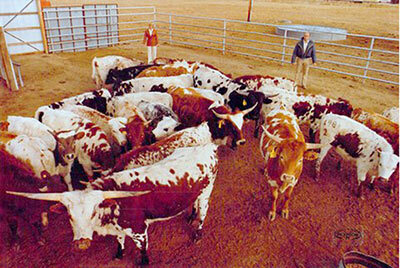 In 1979 DCCI started an all-out effort to accumulate the greatest cows in the breed for this program. Famous cows Measles, Doherty 698, Some What, Swamp Lady, Droop Horn, Sweet N Low, Beauty, Rose Red, Rangers Measles, Maressa, Ghost and dozens more were either purchased or leased for embryo flushing. There were at one time 86 donor cows in production. This was before frozen embryo technology so all eggs were planted hot. At the most, DCCI held 1200 open cows for recip cows. Until the tax law changed in the mid eighties, the embryo transfer business was the hottest thing ever to hit the cattle industry. While the science was clearly developed many in the TL industry believed the recip cow had some genetic contribution. Those opposed to the program assured the industry that every embryo calf was only a percentage Longhorn. DCCI was accused of ruining the breed with a new improved method. Several of these were purchased by Johnnie Hoffman for his starter herd. Not everything works the way it is planned.